If you’ve been buying Tilapia Food from us in the past, you will notice we have changed our brand. We changed it for two reasons: 1. We could not get the original food in a timely manner and 2. The supplier could no longer guarantee their larger sized pellets would be terrestrial animal parts free. We could not tolerate either of those developments and went on a search for Tilapia food that is reliable and free of terrestrial animal parts. We’re happy to announce in November of 2012 we were successful and are now offering Premium Quality Tilapia Fish Food. What’s different about this Premium Quality Tilapia Fish Food? The answer is as easy as ABC. A: To start with a one word answer, EVERYTHING! It’s being made in the USA and not in China where a whole lot of cheap and commonly available fish foods come from. China is a big producer of tilapia and fish food; but I wouldn’t trust any food item coming out of China. Remember the melamine scandal. Melamine, a chemical used in plastics, can make the protein content of milk — and many other food products — appear higher, and, when consumed, it can also cause kidney failure. It was found in Chinese baby formula. Four babies died and 60,000 were sickened by this evil trick inspired by greed and a total lack of human rights. B: You eat what your fish eat: So you want to know what’s in the fish food you feed your fish. This new Premium Quality Tilapia Fish Food is a special blend of Marine and Vegetable Protein, which means that just like we said, it’s “Free Of Terrestrial Animal Parts”. A terrestrial animal is a land animal like a chicken, cow, goat or pig. Now wild tilapia swimming down the Nile River in Africa, the continent of their origin, would not be eating chickens, cows, goats or pigs, would they. So why would you want to feed them fish food that contains the unsellable remains of these animals. Not only that, these animals are being farmed in large Big-Agri farms where they are so densely packed together, they have to be drugged with antibiotics to keep them all from getting sick, not to mention the hormones and steroids that are also being used in these unnatural factory farms. The FDA has approved the use of leftovers from the butchering of land animals to be used in the production of fish food, which means that chicken legs, chicken beaks, pig snouts, pig hooves, various cow parts including brains, which could carry mad cow disease, could enter your food chain through the food you feed your fish. C: Tilapia start out as Omnivores but later become more like Vegetarians: The Tilapia’s digestive system is designed to eat algae, vegetation, other small fish, worms and insects. The newly hatched, called Fry, require a lot of protein for fast growth. You can actually stunt their growth by under feeding them, which is what some breeders do to keep their fish in the sellable fingerling size range. As they mature, they require less protein and are not interested in eating their own fry, which is why it’s possible to raise fry with adult Tilapia in a single tank. We’ve found a Premium Quality Tilapia Feed that takes all this under consideration in their formulas. Check out the protein and fat contents in each of the formulas below. They are carefully formulated to the stage of growth. Our new Premium Quality Tilapia Fish Food comes packaged in 5 lb. bags to 20 lb. bags: You can separate them into smaller bags once they arrive (and even freeze it to keep it fresh). If you’re breeding your own fish, they will go through five stages of growth and will need five different pellet sizes of feed which you can purchase below. From birth to harvest, your tilapia have different dietary requirements and the fish food is formulated appropriately. 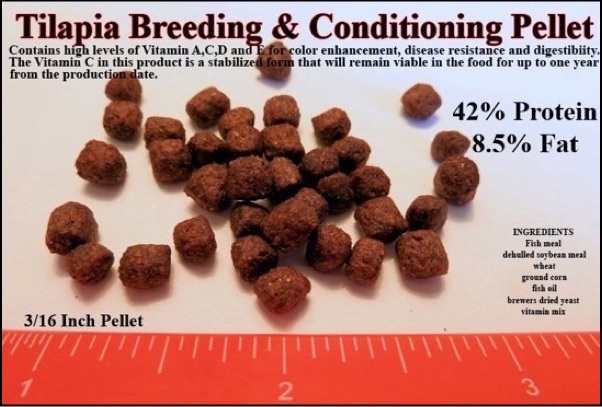 We even have a new Breeding and Conditioning Pellet especially for your breeders. Shipping Charges: All prices listed below include the shipping for U.S.A, it’s Territories and Military. Scroll down to page bottom for Bundle Specials! Here’s where you start, Fry Powder. This is what your newly hatched fry need to grow fast and be healthy. A fine powder used for newly hatched fry for the first 3 weeks of growth. 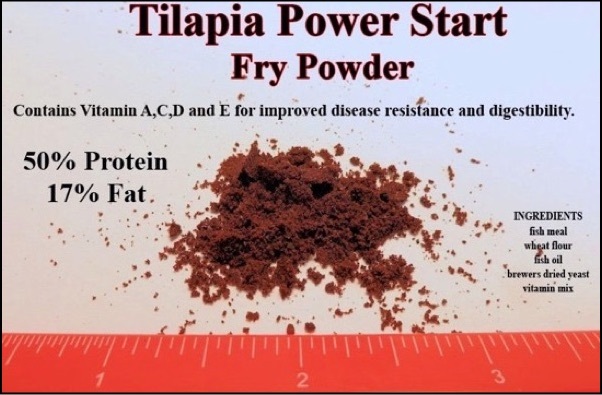 The high protein and fat content in this powder gives your fry a head start on fast growth. Starting fry off right is important because it has a great deal of influence on how fast they will grow as fingerlings and adults. PowerStart Powder can drastically improve growth rates, substantially reducing days until harvest. Next, you move to this size, Fingerling Crumble. When your fish reach 3/4”, you start feeding them this pellet size and keep feeding them this size until they reach 2.5. This is a slow sinking pellet that delivers food to fish at all levels of the water column, very important in higher density stocking situations. 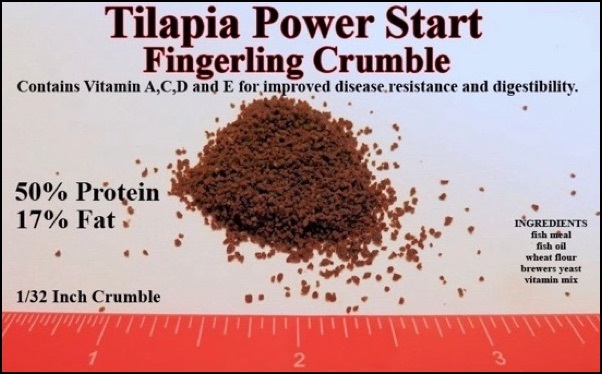 Tilapia growers choose Power Start Fingerling Crumble over other fry and fingerling foods available because it delivers excellent, perfectly balanced nutrition without negatively impacting water quality and clarity. Next, you move to this size, Tilapia Fingerling Pellet. When your fish reach 2 to 2.5”, you start feeding them this pellet size and keep feeding them this size until they reach 4”. This is a precisely formulated nutritional content for growing fingerlings. Your Tilapia fingerlings will quickly double in size on this diet. This slowly sinking pellet helps to encourage aggressive feeding, which in turn grows out strong, healthy tilapia. Extremely high in easily digested proteins and fats to keep fingerlings growing fast. 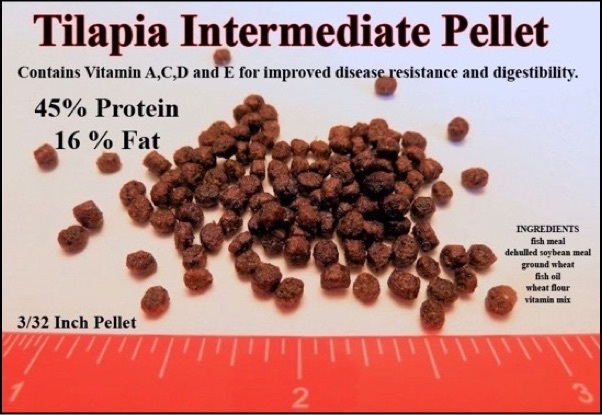 Next, you move to this size pellet, Tilapia Intermediate Pellet. When your fish reach 4”, you start feeding them this pellet size and keep feeding them this size until they reach 6”. 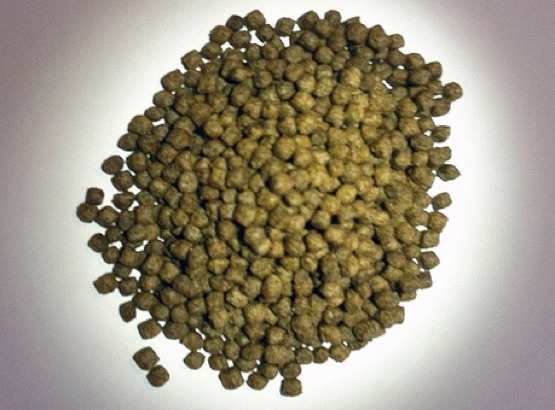 This is the first floating pellet in the series of pellets sized to accommodate a full grow out of your tilapia. Floating pellets allow you to monitor how much your fish are eating, helping you to avoid over or under feeding at this growth stage. At 4” and beyond, tilapia feed aggressively at the surface. An Automatic Fish Feeder also helps you control the amount of fish food you feed your fish. Next, you move to this size pellet, Tilapia Ultimate Growout Pellet. When your fish reach 6”, you start feeding them this pellet size and keep feeding them this size until they are ready for harvest. Adult tilapia benefit from lower fat contents while still getting a relatively high level of protein. This diet matches that need perfectly. According to several industry studies, tilapia foods high in fat often lead to enlarged livers in adult tilapia, and in extreme cases, liver failure. This can lead to higher than expected late stage mortality. Very few commercial foods available address this problem, but you can rest easy when feeding Ultimate Growout Pellets. They contain just 6% fat, while delivering an impressive 36% protein. 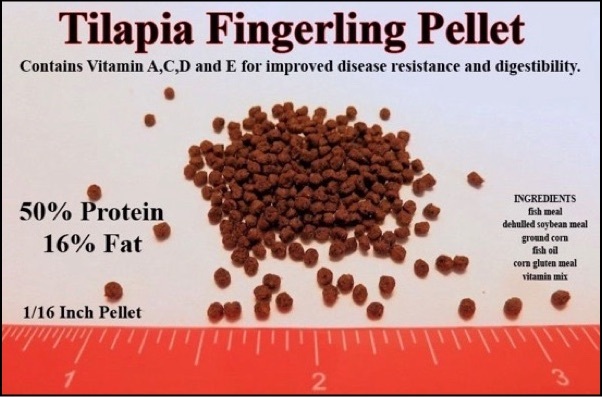 When you look at the protein and fat content of the Tilapia Breeding and Conditioning Pellets, you will see the difference. 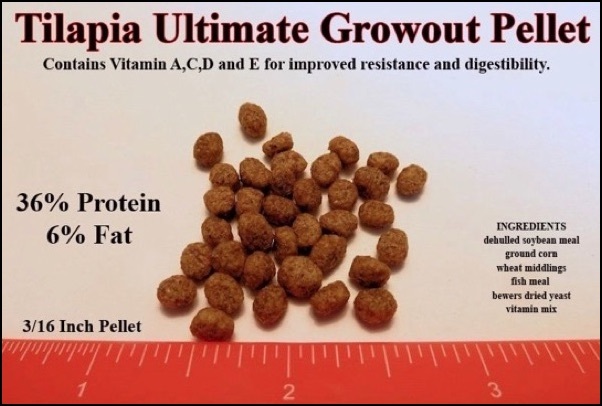 This Formula has 6% more Protein and 2.5% more Fat than the Ultimate Growout Pellet. That’s because high protein levels have proven to increase overall reproduction rates as well as reproductive success in tilapia. During feed trials, this diet led to improved egg size, increased total egg production and improved overall fertility rates. We suggest feeding as a staple diet to active breeding colonies. If you have ordered fingerlings from us and want a full grow out of food then here are some fish feed bundles that will save you time and money.